The combination pill is one of the most commonly prescribed methods of birth control, and the mechanisms it uses to prevent pregnancy are shared by other popular birth control forms, such as the Nuva ring, the patch, and progesterone-only pills. Before considering hormonal birth control, it may be helpful to quickly review what occurs during the menstrual cycle, and in particular, the role of the hormone progesterone. In the menstrual cycle, progesterone surges after the egg is released. Progesterone decreases the creation of the hormones FSH and LH. These two hormones cause the egg to develop and be released, so by decreasing them, progesterone prevents other eggs from developing for the last two weeks of the menstrual cycle (unless the released egg is fertilized, in which case progesterone prevents other eggs from developing for the rest of the pregnancy). Combination pills generally come in packs of 28. In this pack, there are 21 active pills, which are the pills which contain two hormones, progesterone and estrogen. There are 7 in-active pills taken after the 21 active pills. These pills do not contain hormones and are provided to help women stay in the habit of taking the pills. 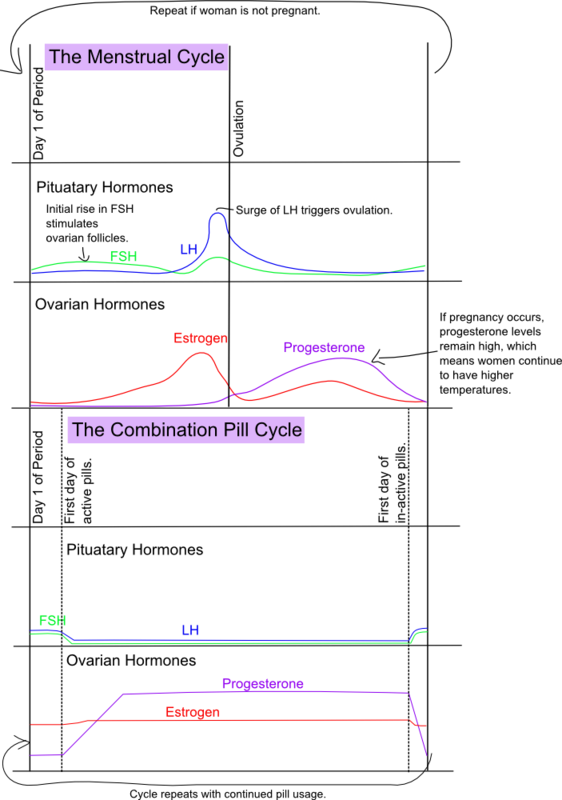 In the diagram above, I've shown the combination pill cycle as starting the first day of a woman's period. This is to help it line up more easily with normal menstruation. Most women would consider the start of the cycle to actually occur at the start of a new pack of pills. At the beginning of a new pack of pills, a woman has not taken hormones in 7 days, so the levels of progesterone and estrogen have dropped. As she takes the first weeks active pills, the concentration of these hormones increase in her body. The most important factor to the effectiveness of the combination pill is that it provides a high level of progesterone (in fact, there are progesterone-only pills which do not contain estrogen). This decreases the production of FSH and LH, which means that ovulation (the release of the egg) does not occur. Without the egg, pregnancy is not possible. After taking 21 active pills, a woman begins taking the 7 inactive pills. One to two days into the inactive pills, she begins her period. This period is NOT menstruation, which only occurs during an unmodified menstruation cycle where ovulation occurs. Instead, this bleeding is withdrawal bleeding, caused by the drop in progesterone level. Withdrawal bleeding stops when the woman begins the next set of active pills. How does taking the combination pill change the body? When women take the combination pill, they produce less of the hormone themselves. Progesterone and estrogen are controlled by a "negative feedback loop," which means that if more of it is present, less is created, and if less is present, more is created. Both hormones are supplied in large quantities by the pill, so, during the time a woman takes the pill, her body stops producing normal quantities of the hormones by itself. This is why the process of starting and stopping the pill is unpleasant for many women - when you start the pill, your body AND the pill are contributing to the total level of estrogen and progesterone, making it too high; when you stop taking the pill, it takes a while for the body to kick into normal hormone production again. The hormonal changes caused by the combination pill are responsible for many of the positive and negative side effects. Acne is effected by estrogen levels (and many other hormones! ), so by keeping estrogen levels high and stable, the pill may improve acne. Many women on the pill have shorter, lighter periods.The high levels of estrogen and progesterone cause the uterus to not line itself as heavily, in preparation for pregnancy. This also makes it more difficult for a fertilized egg to implant, a concern for couples who believe life starts at conception. During the time the contraceptive is being taken, the menstrual cycle is not occurring. Hormonal contraceptives will treat the symptoms of hormonal imbalances, but do not treat the underlying causes. An endocrinologist can often diagnose and treat the underlying causes of menstrual difficulties. I've tried to stick to the facts in this post because if I included my opinions in this, the post would be even longer than it already is! The take-away message is that hormonal birth control does not "regulate" the menstrual cycle - it stops the cycle and replaces it with a completely different cycle.